Special Songs and stories with Miss Chris -- all about the trees. For walkers and up. Poet Dzvinia Orlowsky - author of 6 books, including most recently Bad Harvest. Books available for purchase and signing. Light refreshments will be served. Sponsored by The Friends of the Mattapoisett Library. FREE--for all ages and abilities! & learn some new strategies! Set goals & come each week to practice! Please call or stop by the library to schedule your lesson. We will read simple stories, sing songs and nursery rhymes. This storytime is great for babies and toddlers. Mattapoisett Library's therapy dog, Breton, and his owner, Lenore Everett will be at the library again in the Fall for individual reading & visiting appointments -- great for all ages & reading abilities! All ages are welcome. No registration necessary. Public Book Discussion Groups. Pick up a copy of The Muralist & Reader's Guide. Light refreshments will be served. Creative writers meet on the first and third Thursday of every month from 10:30 to 12:00. Memoir, fiction, essay and poetry genres are discussed and beginners are welcome. No registration, anyone may drop in to see what the group is all about. A weekly knitting group for both beginning and experienced knitters meets every Thursday at the library from 3 to 4 pm. Come by and ask for assistance getting started. You can even borrow needles and choose some wool. Experienced knitters are on hand to discuss patterns and share resources. Everyone is welcome. Songs and stories for walkers and up. Enjoy actress and historian Carol Cohen as she depicts Eleanor Roosevelt, featuring her work during the Depression and the Works Progress Administration. 2:00 PM - 3:00 PM Calling All Gardeners! Jana Milbocker talks about her book "The Garden Tourist: 120 Destination Gardens and Nurseries in the Northeast". Learn about each garden's highlights, ideal times to visit, and special features. Free and open to the public. Please call the library to sign up. Hundreds of lightly used books, DVDs, and CDs for all ages. 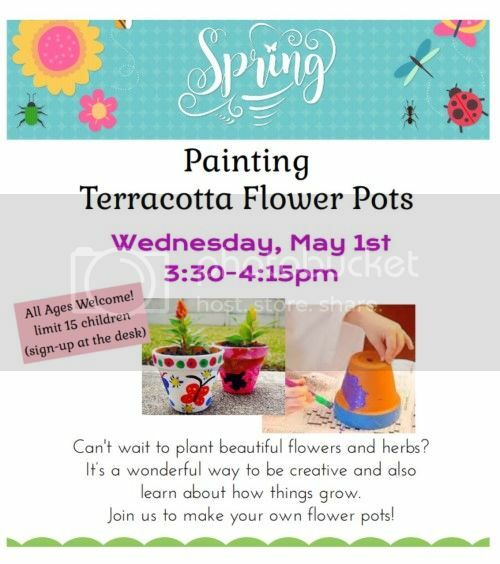 3:30 PM - 4:15 PM Paint Gnomes for your Garden! It’s a fun kids activity that can encourage kids to garden and play outside! Join us to make your own garden gnome for your spring garden or flower pots! All ages welcome. Limit 15, so please call ahead. Thank you. As part of the One Book, Tri-Town Series, historian Anne Kirschmann will introduce this documentary about art projects launched under the Works Progress Administration's Federal Art Project. Free to the public. One Book, Tri Town. Conversation and book signing with Barbara Shapiro. Join in a discussion of The Alice Network by Kate Quinn. Light refreshments will be served. Register for "A Universe of Stories," the fun-filled summer reading program that celebrates space and the 50th anniversary of the Apollo moon landing. There will be events, programs, crafts, and fun for families with children of all ages. Pick up a calendar. Registration will continue for several weeks. The program begins officially on June 25th. Six Days of Summer by Allis Dunning is set in a fictional town very much like Mattapoiset. In fact, a former resident wrote the book! Join in a discussion of this engaging mystery. Light refreshments will be served. A Writer's Workshop set 100 years in the Future -- If you are 8-12 years old with an ability to visualize what the future will bring, this is the place for you. Bring your imagination, we will provide pencils and paper, and be prepared to create science fiction stories that are out of this world. Registration required. Great for all ages! No registration required.